Winter in Japan. Like every season in this amazing country, Japanese winter has its own specific sights, smells, and sounds. Here’s what to see, do and when visiting Japan in winter. I’ll be honest: winter is not our family’s favorite season. Indeed, after leaving our home in Tokyo in 2013, we’ve really enjoyed living in places with year-round heat (see: Thailand, Malaysia, Vietnam, Indonesia and parts of Mexico). That said, we enjoy Japan in winter because of what it means to us. It means seeing family (Keiko’s parents and sisters all live in or near Osaka). It also means seasonal Japanese food. Finally, visiting Japan in winter also means doing certain things that we won’t experience any other time of year. Have You Been to Japan in Winter? Much of Japan’s food is seasonal, so with each new significant change in the climate comes new fish, new veggies, and new dishes on the menu. Winter in Japan brings with it lots of hearty soups and stews, too, as well as a few of our family’s favorite fruits. Find the Best Family Hotels in Japan from Our List! This communal dish is a favorite for Japan in winter. With nabe, the evening’s ingredients are dropped into a bubbling pot in the center of the table. As it cooks, everyone plucks out their meal one bite at a time. Using chopsticks or a specialized straining spoon, you grab what you want and chow down. There are too many versions of nabe to list here, but a few of our favorites include using miso or yuzu-based soups and then throwing in tofu, chicken, our favorite vegetables, and seafood such as clams and oysters. Our all-time favorite nabe uses Japanese spider crab (another Japanese winter food). Vegetarian nabe works great, as well. Want to eat like you’re at a sumo tournament? Then chanko nabe is the way to go. It’s a standard meal for sumo wrestlers training in Ryogoku and has just about everything thrown in. Loosen your belt before digging in. Oden is also under the nabe umbrella of winter Japanese food. It (mostly) consists of stewed fishcakes, tofu and root vegetables that you eat right after being pulled from the savory broth they are boiled in. Oden’s drab color scheme turned me off for years, but now I look forward to it eating every winter in Japan. Just be wary of the karashi, which is a potent yellow mustard. I love it, but it has the kick of wasabi. Two more cousins in the nabe family, both shabu shabu and sukiyaki involve meat, vegetables, and a boiling pot. They’re not specifically Japanese winter cuisine, but people eat them more during Japan’s winter months than at any other time. With Shabu Shabu, you first dump veggies into boiling water to cook. Next, you use your chopsticks to peel up raw slices of beef or pork and dip them into the bubbling broth. Seconds later, you pull the now-cooked morsel out of the water, drag it through a variety of sauces, and pop it into your mouth. Sukiyaki, on the other hand, cooks everything together first. Well, to be more precise, there are many ways to prepare sukiyaki, depending on the region of Japan, but here I will tell you how Kanto-style sukiyaki is prepared. Thin slices of beef mingle with tofu and vegetables such as leeks, mushrooms, and cabbage. The soy-based sauce has sugar in it, so the sweet and savory flavor is hard for anyone to deny. Japanese food at its finest. The key to a successful sukiyaki, however, is the quality and cut of beef. Thinly sliced Wagyu beef is ideal. The final step isn’t for everyone and can be skipped: dip the newly simmered meat and veggies in a bowl of whipped raw egg. Raw eggs are a common Japanese ingredient — sometimes mixed into rice or used as part of a sauce. We love it, but it’s a very Japanese taste. If you’re not into it, it’s not essential. Japan in winter has a number of seasonal fruits. In fact, they are a reason we look forward to winter in Japan. The most common Japanese winter fruit is probably mikan (みかん, Japanese Mandarin oranges). Our family eats our body weight in mikan every Japanese winter. Kaki (柿, persimmon) is another favorite, as well as yuzu (柚子), the citrus family’s lumpy uncle that tastes delicious as a syrup stirred into hot drinks. Around the winter solstice, it’s not unusual to find a few yuzu floating in an onsen, either. Whether you’re visiting Tokyo, Osaka, Kyoto or further afield, there is plenty of amazing places to see across Japan in winter. Here are a few of our favorite Japanese winter attractions. Nearly every major Japanese city has at least one jaw-dropping holiday light display. That said, certain illumination displays stand out more than others. In Tokyo, head to places like Omotesando, Marunouchi/Ginza. The Tokyo Midtown and Roppongi Hills complexes in Roppongi are also decked out with holiday lighting. The Shiodome area of Tokyo (on the monorail line to Odaiba) is also a sight to behold. In Osaka, you have the Midosuji Illumination and Osaka Hikari-Renaissance, but in Kansai (and possibly in all of Japan), the Kobe Luminarie reigns supreme. 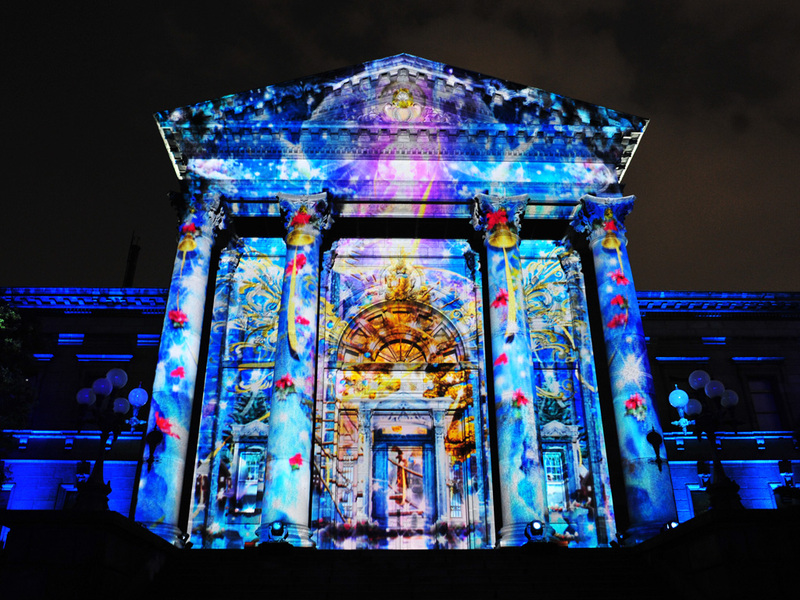 Keep in mind, however, that it can get very crowded at the Kobe Luminarie, and quite cold at night. I went with my in-laws during my first Japanese winter and I don’t know if I’d go again. Then again, we were there on a weekend evening, which is more crowded. Certain traditional Japanese villages have an almost magical air to them during winter in Japan. Walking past the homes in Hida, Takayama feels like stepping back in time. The same could be said for Shirakawago, in Gifu. The snowy parts of Japan in wintertime are magical enough, but when you see these old houses covered in white…it’s quite special. Kyoto in winter is also a special place to be. As much as I like visiting in Japan in spring or autumn (summers are dreadfully hot), winter in Kyoto can be just as enchanting. Keiko’s family lives in the northern part of Osaka, which makes Kyoto only an hour train ride away. Therefore, whenever I visit the in-law’s during the New Year holidays, I always visit Kyoto in January for a day or two — with kids or without. Summers in Japan are packed with activities for kids, but Japan in winter is not that different. Here are just a few recommended things to do in Japan during winter. Places like Nagano, Hakuba, and Niseko are known and loved by snow bunnies all over the world. If you’re in Tokyo, however, and want only an overnight trip, places like Gunma have beautiful powder, a long ski season, and can be reached in a few hours by train. Whether you’re an experienced skier or looking for beginner lessons for you or your kids, the guys that run Canyons in Gunma are a great place to start. If you’re interested in watching sumo, the first basho (tournament) of the year happens over two weeks in Tokyo in January at the stadium in Ryogoku (there more to do in Ryogoku than just sumo, however). About a month later, it’s Tokyo marathon time, when many of the city’s streets are shut down for participants and fans. These are just a few of the many sporting events happening across Japan in winter. One of our favorite activities during winter in Japan is to slip into a bath of mineral-rich, geothermally warmed water. I know people who can yammer on for hours about how certain nutrient-rich baths can cure ailments or augment your complexion, but I visit onsen for the same reason most Japanese people do: to relax. Lots of people want to see (and photograph) the monkeys in Nagano prefecture, but if you prefer your tubs filled with homo sapiens, then the onsens in Gero (in Gifu), Yagen (in Amori) and Nyuto (in Akita) will deliver. Perhaps you’re in Tokyo and just looking for a quick day or two out of town. For that, there’s Hakone, the capital’s most popular (and most accessible) mountain retreat. Our favorite onsen, however, is in Gunma prefecture. Takaragawa onsen has a lot of rotenburo (outdoor tubs) that hug the side or a picturesque creek. Japan in winter isn’t the same for me without at least one visit. Unlike most Japanese onsens, Takaragawa’s main tubs for both genders, which means that you can sit with all of your loved ones — male and female — in one tub. This is one of my favorite things to do during winter in Japan. Naked, outdoors, and submerged in super hot water, I only hear the babbling creek because the falling snow muffles out other forest sounds. Snowflakes land my hair, then fall into the water and melt immediately. It’s a borderline religious experience — I guess that’s what I’m trying to say. Visit Japan in winter and you’ll find your event calendar filling up quickly. Here are just a few wintertime events worth checking out for yourself. For snow lanterns, you can visit the Yokote Kamakura Festival in Akita or the Yunishigawa Onsen Kamakura Festival in Tochigi. The Snow Monsters Festival of Zao (Yamagata) is also astounding, but the big daddy of them all is the Sapporo Snow Festival, which delivers statues and other frozen artwork that often measure up to 5 stories tall. Similar festivals in Asahikawa and Iwate are not as large, but still astounding. Every year on the second Monday of January, hordes of Japanese 20-year-olds dress in stunning traditional (and often not-so-traditional) kimono. Afterward, they attend a ceremony where they are officially announced as adults. The ceremony is frequently (and often accurately) accused of being boring and berating its participants. Yet afterward, many of these newly-minted adults hit the town to meet for a meal, take pictures, or visit a shrine with family. Okay, okay, so these two may not make anyone’s top 10 list for Japan winter activities. However, I feel they should be mentioned because we’ve enjoyed them so much. Classy it ain’t, but we love this cheesy hot spa attraction. Occupying the top floors of a nondescript Osaka building, Spa World has the best of both worlds. Inside, you can have the “traditional” (ie. naked, gender-specific) soak in a hot tub. Or if you prefer, you can put on your swimsuit and head to the enclosed roof for a small water park with heated water and waterslides. If you want the sensation of sitting in hot water outdoors, there are a few tubs for that, as well. We usually visit Osaka in January for New Year’s time, so this has become an annual Japanese winter tradition for our family. I wrote a more detailed account of a day in Spa World in the Japan Times. Still wondering if your kids would enjoy? Read more about what others say about Spa World in Osaka. Fuji-Q Highland delivers on both counts. It’s one of Japan’s biggest amusement parks, and also happens to have one of Japan’s largest outdoor ice skating rinks. Oh, and it’s close enough to Mount Fuji to capture that postcard-perfect selfie. What’s best about visiting Fuji-Q Highland during winter in Japan is because the lines for are much shorter. And they have some amazing rides — with a few Guinness records over the years. We appreciate short roller coaster lines in any country. However, we have a special appreciation for Japan in winter because the lines shrink considerably. Visit Japan in the summer and you’ll be waiting in lines much, much longer. For example, I was once told at Tokyo Disneyland that the wait for a water ride was FOUR HOURS. If you dress warmly and want to see a snow-capped Mount Fuji on a clear winter afternoon, there are few places better. A week or two exploring Japan in winter can make for an amazing adventure. Here are two additional bits of advice for anyone heading to Japan during the winter months. But There isn’t much central heating across Japan in winter. At least it doesn’t exist on the same scale as it does in much of the West. With this in mind, remember that if you’re entering homes and some temples and shrines, you may need to take your shoes off. You might want to consider picking up a cheap pair of slippers to wear indoors. Also, in most Japanese homes and apartments, people heat individual rooms, not the entire house. This means that living and dining areas may be warm and toasty, but the hallways and bathrooms might be frigid. Keep a couple sets of hokkairo in your bag. You can find them at nearly every convenience store in Japan during wintertime. Simply open the packet and peel off the tape and suddenly you have a small, disposable heating pad that stays warm for hours. Many Japanese parents stick these onto the lower backs of children under their coats to stay warm. I personally love the ones made to keep toes warm. Finished Packing? The Best Packing Cubes Help You Pack Better! Talk to any Japanese person about their homeland and you might here a commonly-used line. “Japan has four distinct seasons,” they’ll say, and they’re right. I rolled my eyes the first hundred times that my wife and Japanese friends said this. I mean, of course they have four seasons! Don’t we all? Then I moved to Japan, and now I get it. More than just temperature changes, each of the seasons in Japan is very unique and distinct from the last. Expect different produce in the markets, different fish on the grills, and different smells in the air. Nevertheless, knowing what the weather in Japan will be like when you visit is important. It will help you know what to pack and how much to bring. Here’s a quick (and very general) breakdown of weather in Japan in November through March. Please note, that weather in Northern Japan gets colder much faster and stays cold for much longer. While October and November in Tokyo and Osaka are autumn-like temperatures, there’s already loads of snow on the ground in Hokkaido and northern Honshu. The entire country is cold now, with meters of snow in the north and occasional snowstorms in the major cities of Tokyo, Kyoto, and Osaka. Spring is around the corner for Japan, but you may still get cold snaps and snow in Tokyo even as the cherry blossoms bloom. What did you enjoy? Where did you go? What kind of winter activities do you love the most? Tell us in the comments below or contact me directly. Disclaimer: This article contains affiliate links. That means that if you buy something or book a hotel in Japan during winter using one of my links, we might get a small commission. You pay nothing extra, so don’t worry. Also, everything you see here is just my personal opinion. I only recommend places, activities, and gear that I believe will genuinely help my readers get the most out of Japanese winter. We loved exploring winter in Japan, and I think there are lots of fun things to do in Japanese winter, for families, for couples, and for solo travelers. If you know of more fun things to do in Japan in winter, let me know!